It is simple as that. Visiting Galapagos is a trip of a lifetime, a privileged adventure. What Makes Galapagos So Special? The amazing wildlife is always the first thing that comes to mind but there is more to Galapagos Islands than that. The landscape, the flora, the history, the people... all helps to make Galapagos such a unique place to visit. 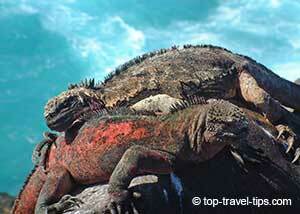 The Galapagos Archipelago consists of 13 major islands and number of smaller islands, islets and rocks. 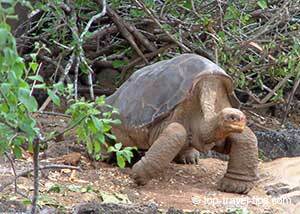 Galapagos are located just under the equator, about 600 miles (960 km) west of Ecuador, South-America. Galapagos Islands are so special that over 95% of the islands are national parks and the whole of Galapagos is an UNESCO World Heritage Site. The Galapagos is second only to the Great Barrier Reef National Park of Australia in terms of the size of marine area protected. 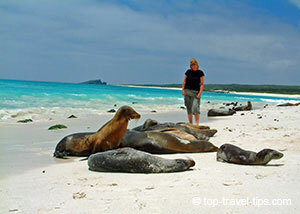 Visiting Galapagos requires advance planning (strongly recommended). Due to the sensitive environment and wildlife, tourist access is limited and highly regulated. Tourists are only allowed to visit certain sites and most of those only if accompanied by a legit guide. Like most tourists, we flew in to San Cristobal from Ecuador. We went straight from the airport to the small yacht (only 10 guests) which we spent an unforgettable week touring some of the islands. Our Galapagos adventure started with a big bang. After short sailing, we stopped at Lobos Island and we went snorkeling... with the sea lions. This was the most amazing experience ever. The sea lions were so curious and so playful. They swam up to us and blew bubbles in our faces. They then turned and tossed effortlessly and invited us to play. You could almost see their smiles when we tried to imitate the movements... can only guess we were not as graceful. For us swimming with the sea lions was one of the highlights of visiting Galapagos, an experience we will never forget. We also had our first glance of the cute looking blue-footed boobies, impressive great frigatebirds, lava lizards, Sally Lightfoot crab and more. Our Galapagos adventure was definitely off to a good start. The next morning we woke up on Darwin Bay Beach on Genovesa Island. We went on a guided two hours walk in a rough surreal landscape, surrounded by tame birds. There were great frigatebirds, red-footed boobies, masked boobies and swallow-tailed gulls. 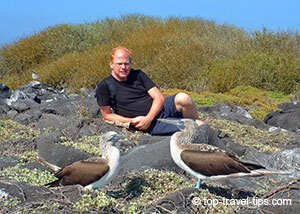 Visiting Galapagos is truly a Paradise for bird lovers. The following day we spent the morning outside the northwestern part of Isabela Island, the largest island in the Galapagos Archipelago. We spent the day snorkeling and kayaking on the equator. We saw lot of fish and sea lions of course, but also with giant tortoises, penguins and marine iguanas. The afternoon we spent on Punta Espinosa on Fernandina Island. We saw lot of sea lions, Sally Lightfoot crab, the Flightless Cormorant but the animal of the day was the amazing ancient looking Galapagos Marine Iguana. The Iguanas are so tame you had to be careful not to step on them (which I actually accidently did!). On the third day, we visited James Bay on Santiago Island in the morning. There we met many good friends by now, like sea lions and iguanas, but the highlight was seeing fur seals. In the afternoon, we visited Bartholomew Island and walked up on small volcano to enjoy the beautiful view over Pinnacle Rock. The landscape is spectacular, very rough and volcanic. The fourth day we visited Santa Cruz Island, were we visited the Charles Darwin Research Station. There we met Lonesome Georg, the last living Pinta Island Tortoise, which sadly has now passed away (June 2012), reducing the world's number of animal species by one. In the afternoon, we took a bus into the highlands to search for giant tortoises. We found some, including two mating (the size difference between the sexes in dazzling). The following day we visited Floreana Island. We snorkeled outside Devil's Crown and saw some sharks as well as the usual suspects by now. We then visited the Post Office Bay were we left a postcard to a family members (which has still not arrived). The sixth day we visited Española Island. We spent time with the tame blue-footed boobies and sea lions, you can literally sit next to them. The waved albatrosses were though the highlight of the day, but they were just arriving to the islands for their mating season. The final day we sailed back to San Cristobal, to get our flight back to Ecuador. We spent unforgettable week touring some of the Galapagos Islands. Visiting Galapagos is truly a trip of a lifetime, something we will always cherish and feel very privileged to have experienced. Because there is no place like Galapagos, it is as simple as that.